Objective(s): An individual's risk of developing cardiovascular disease (CVD) is influenced by genetic factors. 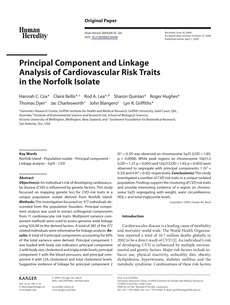 This study focussed on mapping genetic loci for CVD-risk traits in a unique population isolate derived from Norfolk Island. Methods: This investigation focussed on 377 individuals descended from the population founders. Principal component analysis was used to extract orthogonal components from 11 cardiovascular risk traits. Multipoint variance component methods were used to assess genome-wide linkage using SOLAR to the derived factors. A total of 285 of the 377 related individuals were informative for linkage analysis. Results: A total of 4 principal components accounting for 83% of the total variance were derived. Principal component 1 was loaded with body size indicators; principal component 2 with body size, cholesterol and triglyceride levels; principal component 3 with the blood pressures; and principal component 4 with LDL-cholesterol and total cholesterol levels. Suggestive evidence of linkage for principal component 2 (h(2) = 0.35) was observed on chromosome 5q35 (LOD = 1.85; p = 0.0008). While peak regions on chromosome 10p11.2 (LOD = 1.27; p = 0.005) and 12q13 (LOD = 1.63; p = 0.003) were observed to segregate with principal components 1 (h(2) = 0.33) and 4 (h(2) = 0.42), respectively. Conclusion(s): This study investigated a number of CVD risk traits in a unique isolated population. Findings support the clustering of CVD risk traits and provide interesting evidence of a region on chromosome 5q35 segregating with weight, waist circumference, HDL-c and total triglyceride levels.